Before embarking on this mitt last night, I had made 5-1/2 pairs of handwarmers. I’ve done four different thumb treatments. And I have studied more glove patterns than I care to admit. Based on all of that, I improvised this pattern. Slight ribbing at the bottom of the longish wrist shaft, subtle shaping in the hand, generous ribbing around the fingers. The section from the bottom to top of the thumbhole was knit flat, which was an approach I hadn’t done yet. And it came out great, right? * Except one thing: This yarn is trash! The photo doesn’t really tell the tale — and it does look better on than off — but it seriously looks like I pinched this glove off a homeless person. I bought the yarn (Nora Aya), despite questioning whether it was actually used and rewound, because I was taken with the colors: This bright green gives way to lilac and turquoise and back to green. All of which would happen in the second mitt if I were to make it. But I really doubt I’ll invest the time. *I’m resisting saying “fits like a glove,” but honestly, it fits like a glove. 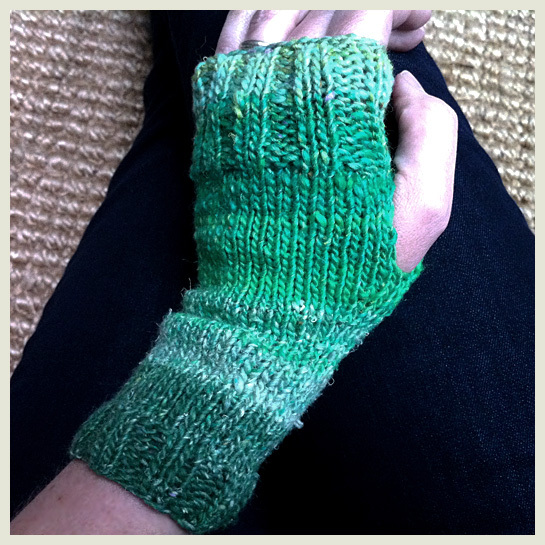 This entry was posted in Projects and tagged gloves, knitting. Bookmark the permalink. I’d never heard of Aya — it’s always Kureyon all the time — so I assumed the other was better. No?